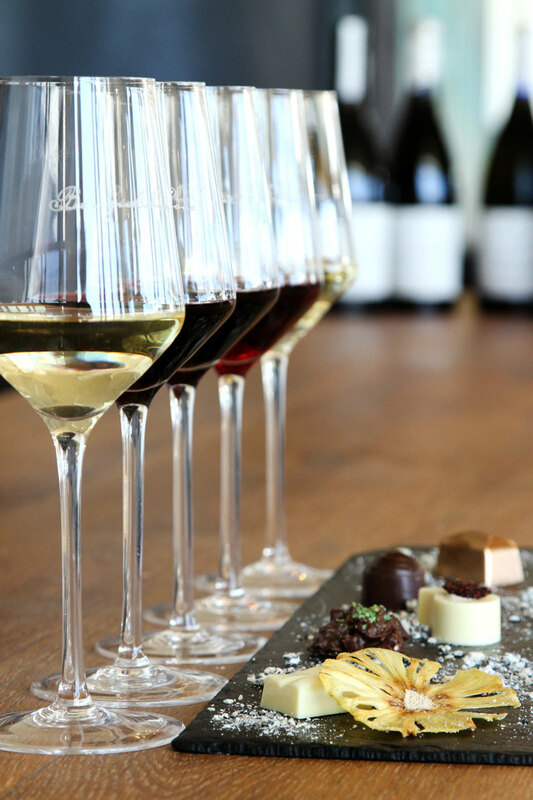 Treat yourself to a tantalizing chocolate and wine pairing at Benguela Cove Lagoon Wine Estate. Paired with delightfully sweet handmade chocolates, our award winning Benguela Cove wine's will keep you coming back for more. 1. Ode to the Fynbos: White Belgium chocolate with apple ganache, fynbos jelly and dried pineapple, served with a tasting of the Benguela Cove Sauvignon Semillon 2016. 2. Benguela Boulder: This chocolate boulder celebrates the estate’s proximity to the ocean milk chocolate with Turkish apricots, hazelnuts and edible moss. This is accompanied by a tasting of Benguela Cove Chardonnay 2016 that mirrors the tangy apricots with a nutty hem that trails behind. 3. Pretty Perfect: Who would’ve thought? This pairing illustrates how the impossible can be made possible. Twenty years ago no one would’ve considered planting vines here. Now the pinot Noir 2015 is proof that wines of elegance and finesse can be produced here. It is paired with a white choc dome filled with litchi and rose ganache, served with dried strawberry. 4. Savoury spells: The word savoury is often misunderstood. It refers to the subtle thread of saltiness that supports the fruit in the wine and adds another flavor dimension. A periwinkle shaped chocolate introduces a creamy ganache with olive crackling, served with a tasting of the Benguela Cove Syrah 2015. 5. We’re smokin! As genteel the wine from Benguela Cove can be, so can they also portray masculinity with broad shoulders and a solid backbone. The treasure box shaped chocolate is filled with a smoky ganache that adds to the intensity of the Benguela Cove Cabernet Sauvignon while illuminating the dark fruit core.